Think Reusable. And renew, recycle, reuse! Reduce your plastic use. 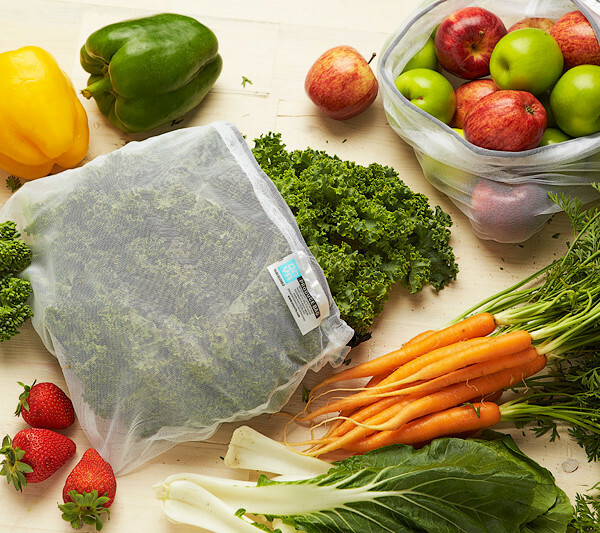 Convenient fresh Produce Bags, use them to select and carry your fruit and veggies. As the bags let water and air flow through, use them to wash your vegies before popping in the fridge, or simply hang them to keep fresh. Avoids 'sweating' from plastic bags. The produce bags come in a colourful holder pouch, to make it easy to carry your produce bags to the shop. Available in 5 pack and 8 pack. - each bag can easily carry 2kg of produce. - see-through, making checkout a breeze. - most fruit and vegetables store better and last longer not sitting in a plastic bag where they can sweat. You can also hang the bags on a hook in the pantry. - once home, you can use the bags as a colander to clean the produce inside. - cool hand wash recommended or they can be washed on a cool gentle cycle in the washing machine. Our Reusable Produce Bags are an easy replacement for single use plastic fruit and vegetable bags in the supermarket or green grocer. Traditional single use plastic bags can also cause ‘sweating’ making the life cycle of your fresh produce much shorter. The open nature of the mesh bags allows your produce to ‘breathe’ which gives it a longer life. With many people trying to attain a closer to zero waste lifestyle, our produce bags allow you to do your weekly shop without the need for single use plastic. 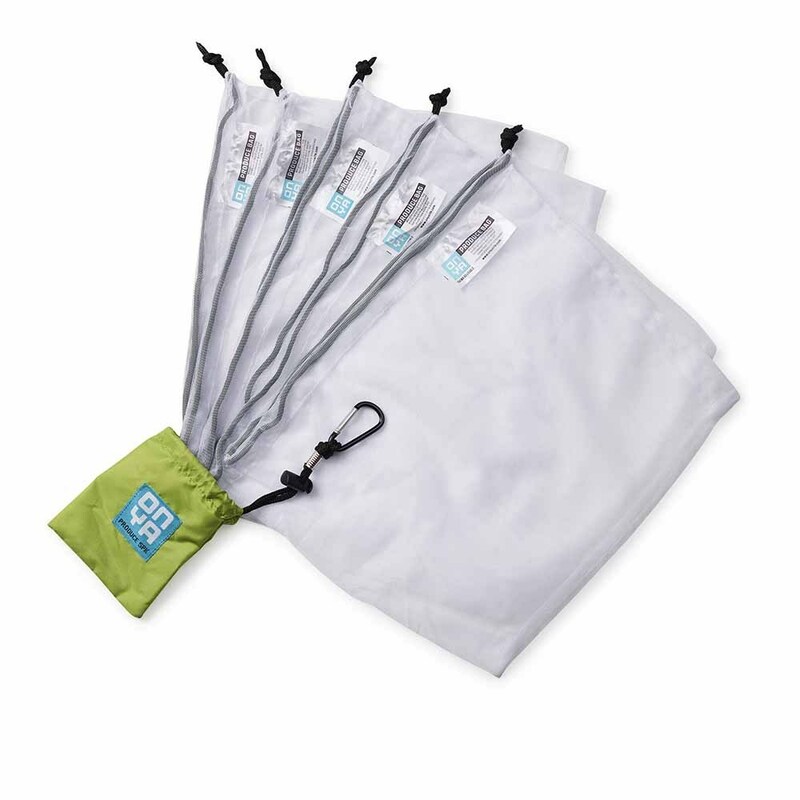 Available in either a 5 or an 8 pack, our produce bags stuff down into a brightly coloured pouch the size of your fist when not it use and can attach to a belt or bag by way of it’s strong carabiner clip. Crafted from special rPet fabric, our produce bags are made from recycled plastic drink bottles. A note on our packaging: Our commitment to sustainablility extends to our box packaging which is made from post-consumer recycled material and printed with water based inks so it is suitable for both recycling or composting! Our very light but deceptively strong mesh bags can hold up to 2kgs of produce and feature a gussett and drawsting tie. Weighing in at only 10 grams per bag, our reusable produce bags barely register on a scale and the see through mesh bags allow shop assistants to know exactly what is inside your produce bag at a glance. The bags can be washed simply with a cool water handwash when the need arises, or they can be put on a cool gentle cycle in the washing machine. 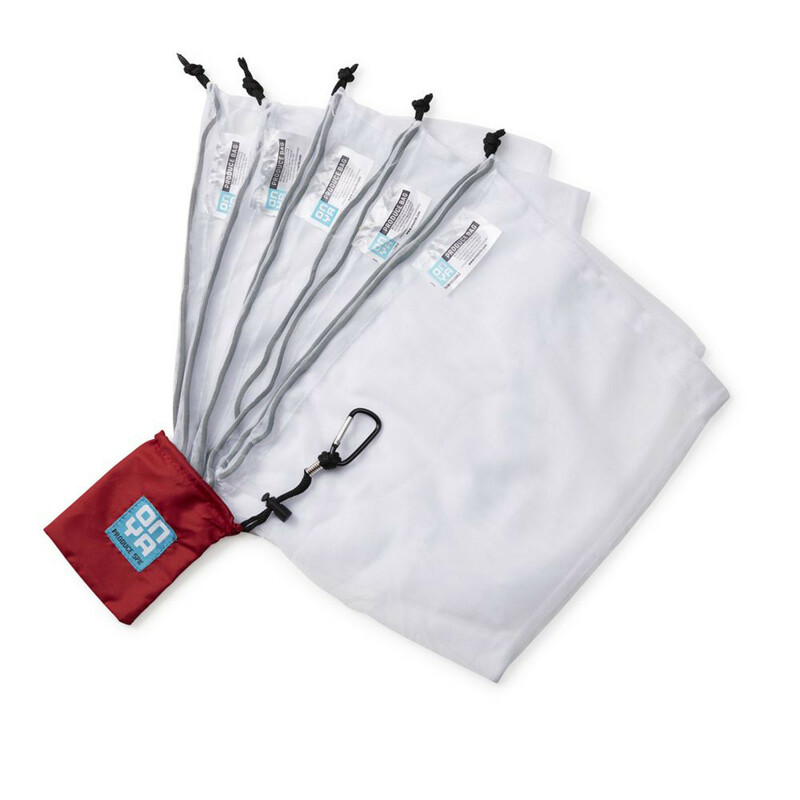 - See-through toiletry bags for international travel restrictions. - Consuming less over time: reusing a mesh bag instead of using a new bag at the supermarket each time is good news for the environment - and your produce. - Bag is made from 100% rPET (recycled plastic drink bottles). This means 60% less energy and 90% less water went into making this bag as compared to similar non-recycled products. Ingredients: Recycle plastic bottles - save the oceans! Produce bags - Crafted from special rPet fabric, our produce bags are made from recycled plastic drink bottles. Box packaging - Made from post-consumer recycled material and printed with water based inks so it is suitable for both recycling or composting!